We used a rapid and simple protocol using lysolecithin for mapping HS sites in vivo. The protocol is based on partial digestion with DNase I of exponentially growing cells following permeabilization by short treatment with lysolecithin. Using this protocol, we analyzed the chromatin structure of the region surrounding two overlapping elements, an origin of bidirectional DNA replication and the GAS41 promoter, in chicken myelomonocytic HD11 cells arrested in G0, G0 and S phases as well as at the G0/S border. The results show that the chromatin of this region became more nuclease sensitive when cells were arrested in G0 phase and that this change in chromatin structure was reversible after the cells began to enter S phase. Key terms: chromatin structure, origin of bidirectional replication, Lysozyme, GAS41, promoter. Most of the chromosomal DNA in the nucleus of eukaryotic cells is tightly packaged. In contrast, actively transcribed genes are packaged into an altered chromatin structure characterized by a variety of features including increased sensitivity to nucleases, numerous hypersensitive sites (HS) known as local openings of the chromatin, decreased level of DNA methylation, histone acetylation etc. (Elgin, 1995). HS sites are usually smaller than 400 bp and mostly located in the 5' flanking region of actively transcribed genes. The accessibility of chromosomal DNA to nuclear proteins such as transcription factors etc. is thought to occur preferentially at these sites. Indeed, in many cases, they are often co-mapped with regulatory DNA elements of known functions including promoters, transcriptional enhancers, hormone response elements, origins of DNA replication etc. (Elgin, 1988). HS sites are mapped in vitro by partial digestion of isolated nuclei with DNase I followed by indirect end-labelling (Hewish and Burgoyne, 1973; Wu, 1980). The chicken lysozyme-GAS41 (glioma-amplified sequence 41) locus contains numerous HS sites, some of which are mapped to regulatory elements important for the regulation of lysozyme expression in macrophages as well as during the differentiation of the oviduct (Fritton et al., 1987; Steiner et al., 1987; Jagle et al., 1997) and two closely spaced sites are associated with two overlapping elements, an origin of DNA replication (OBR) and the promoter of the downstream located GAS41 gene (Phi-van et al., 1998; Phi-van and Strátling, 1999; Zimmermann et al., 2002). In this study, we used lysolecithin to permeabilize intact cells to map the HS sites located within the CpG island between the lysozyme and GAS41 genes in myelomonocytic HD11 cells in vivo. Using this procedure, we further show that the chromatin of OBR/GAS41 promoter region changes and becomes more sensitive in cells arrested in G1 phase of the cell cycle. HD11 cells (Beug et al., 1979) were maintained in Iscove's modified Dulbecco's medium (IMDM), supplemented with 8% fetal calf serum (FCS), 2% chicken serum, 100 U/ml penicillin and 100 [ig/ml streptomycin (complete IMDM) under 5% C02 at 37°C. For synchronization, cells were grown in 15 cm diameter dishes (2 x 107 each) to 80-90% confluence, arrested in G0 phase by maintenance in IMDM without FCS and chicken serum for at least 48 hours, and then incubated in complete IMDM for 4 hours for entering G1 phase. G0-arrested cells were transferred to complete IMDM containing 20 µg/ml aphidicolin (Sigma, Deisenhofen, Germany) and maintained for at least 12 hours to accumulate at the G1/S boundary. To enter S phase, G0-arrested cells were washed twice in complete IMDM to remove aphidicolin and subsequently incubated at 37°C for 3 hours. Alternatively, serum- starved cells were returned to complete IMDM containing 400 µM mimosine (Sigma, Taufkirchen, Germany) for at least 12 hours for accumulation in late G1 phase. The synchronized cells were controlled by flow-cytometric analysis. Briefly, trypsinized cells were stained with 10 µg/ml Hoechst 33342 for 15 minutes at 37°C and analyzed using a MoFlo from DakoCytomation (Hamburg, Germany). Cells washed once in phosphate-buffered saline (PBS) were permeabilized in 4 ml of solution 1 containing 150 mM sucrose, 80 mM KC1, 35 mM HEPES (pH 7.4), 5 mM K2HP04, 5 mM MgCl2, 0.5 mM CaCl2 and 0.05% L-a-lysophosphatidylcholine (lysolecithin) (Sigma, Taufkirchen, Germany) for 1 min at 37°C. Following washing once in 10 ml of solution 1 without lysolecithin, cells were incubated in 4 ml of solution 2 containing 150 mM sucrose, 80 mM KC1, 35 mM HEPES (pH 7.4), 5 mM K2HP04, 5 mM MgCl2, 2 mM CaCl2 and 100 to 500 units DNase I for 5 min at room temperature. After removal of the DNase I solution, cells were lysed immediately in solution 3 containing 0.3 M NaCl, 50 mM Tris-HCl (pH 8.0), 25 mM EDTA, 0.2 % SDS and 0.2 mg/ml proteinase K, followed by incubation at 37°C overnight. The resulting probe was extracted twice with phenol/chloroform/isoamyl alcohol (12:12:1), once with chloroform/isoamyl alcohol (24:1), and precipitated with ethanol. After centrifugation, the pellet was washed with 80% ethanol, dried under vacuum and dissolved in TE [10 mM Tris-HCl (pH 7.5) and 1 mM EDTA]. The probe was digested with 50 [xg/ml RNase A for 2.5 hours at 37°C, followed by treatment with proteinase K for 2 hours at 37°C and extraction with phenol/chloroform/isoamyl alcohol. Then, DNA was precipitated with ethanol, dried under vacuum and dissolved in TE. HS sites were mapped by the technique of indirect end labelling (Wu, 1980). Briefly, 10 µg DNA were digested with Hindlll, and fragments were resolved by electrophoresis on 1% agarose gels run in TPE [36 mM Tris, 30 mM NaH2P04 (pH 8.0), and 1 mM EDTA] and transferred onto nylon membranes by standard procedures (Southern, 1975). Then, the membranes were hybridized to P32-labeled probe CeHIO to map HS sites from the downstream located Hind III site as described previously (Phi-van and Stratling, 1999). For in vitro mapping of HS sites, nuclei from HD11 cells were digested with 150 units/ml DNase I as described previously (Phi-van and Stratling, 1999). DNA from digested nuclei was isolated, and HS sites were mapped using probe CeH10 as described above. We have previously mapped the OBR located between the lysozyme gene and the immediately downstream located GAS41 gene (Zimmermann et al., 2002). Besides overlapping with GAS41 promoter, the OBR is associated with two closely spaced HS sites separated by ~100 bp. These sites were mapped in vitro by the technique of indirect end- labeling following digestion of isolated nuclei from exponentially growing cells with DNase I (Hewish and Burgoyne, 1973; Wu, 1980). In this study, we analyzed the chromatin structure in vivo by a mapping procedure using intact cells. For this purpose, adherently growing HD11 cells were permeabilized by treatment with lysolecithin and then digested with increasing concentrations of DNase I. Following digestion of purified genomic DNA with Hindlll, the HS sites were mapped by indirect end-labeling from the downstream located Hindlll restriction site (H10) (see map in Fig. 1A). As shown in Figure 1B, hybridization of the Southern blot with probe CeH1O revealed HS sites dependent on DNase I concentrations. Prominent HS sites were obtained when DNase I at the concentration of 250 units/ ml was used, whereas most of DNA was digested by 500 units/ml DNase I. Figure 1B shows further that in addition to the upstream located prominently appearing HS sites at the OBR and the GAS41 promoter three other HS sites are present in the coding region of the GAS41 gene. Thus, these results are consistent with those obtained from the in vitro mapping using isolated nuclei (Fig. 1C). Using the presently described procedure we analyzed the chromatin structure of the OBR/GAS41 promoter region during the cell cycle. 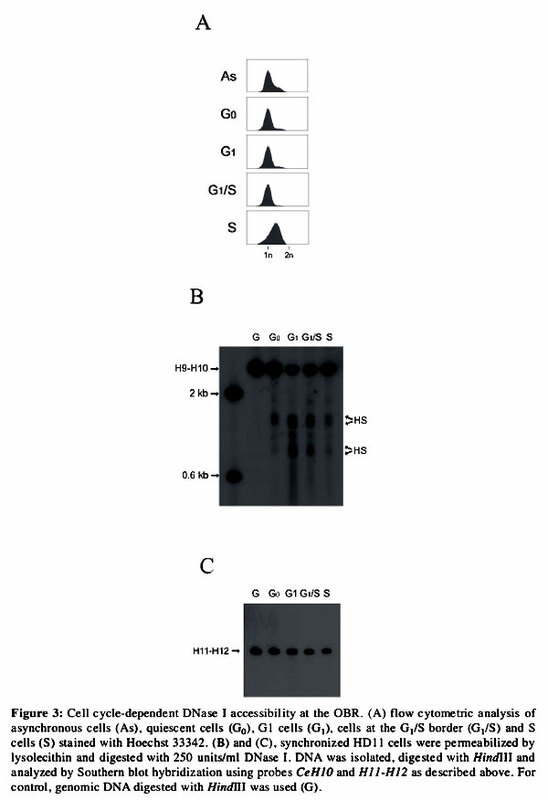 Starvation of cells for serum induced arrest of cells in Go phase, and the Go-arrested cells were then re-fed with complete medium for entering G0 phase or with complete medium containing aphidicolin, a potent inhibitor of DNA polymerase a, for enrichment at the G0/S border before they were returned to drug-free complete medium to enter S phase. The synchronization procedure used is represented in Fig. 2. The synchronized cells were monitored by flow-cytometric analysis using Hoechst 33342 for DNA staining, and their DNA profiles are shown in Figure 3A. Thus, serum-starved cells that were re-fed with complete medium for 4 hours were considered as G0 cells, possibly as late G1 cells because the doubling time of HD11 cells is less than 24 hours under optimal culture conditions. Most G0 and G1 cells as well as aphidicolin-synchronized cells at the G1/S border contain a 2n DNA amount, although aphidicolin has been shown to be an inhibitor of the chain elongation of DNA replication and arrests cells after the establishment of replication forks (Dijkwel and Hamlin, 1992; Levenson and Hamlin, 1993). Moreover, the reagent is not able to inhibit DNA polymerase y which is essential for the synthesis of mitochondrial DNA (Ikegami et al., 1978). S cells, 3 hours after removal of aphidicolin, display a DNA content of 2n to 4n. Cells synchronized by this protocol using aphidicolin were then subjected to partial digestion with 250 units/ml DNase I as described above. An analysis of the chromatin structure of the OBR/GAS41 promoter region is shown in Figure 3B. It is apparent that the overall sensitivity to DNase I of the chromatin of this region increased in cells arrested in G1 phase in comparison to the nuclease sensitivity in serum-starved G0 cells or of cells collected from S phase and at the G1/S border. Accordingly, the intensity of the 3.3-kb DNA band that corresponded to the Hindlll fragment (H9-H10) containing the OBR and the GAS41 promoter was markedly reduced. Thus, the nuclease sensitivity in synchronized cells decreased in the following order, G1 > G1/S > S > G0. Figure 3B shows further that the HS sites became much more sensitive in G1 phase and at the G1/S border than in S and G0 phases. 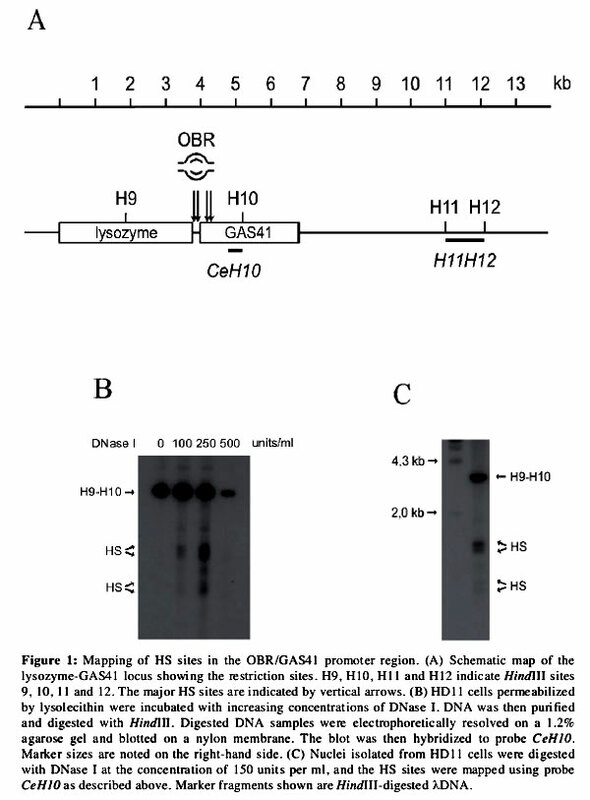 To test whether the cell-cycle-dependent high DNase I sensitivity is restricted to the region surrounding the OBR and the GAS41 promoter, a Southern blot was hybridized to probe H11- H12 (see map in Fig. 1A) to analyze the region located downstream of the OBR. As seen in Figure 3C, we found no major differences in intensity of the diagnostic DNA band HI 1-HI2 during the cell cycle. Eukaryotic genomes are packaged together with histones and non-histone proteins into chromatin. The accessibility of chromatin in the interphase to nuclear factors is restricted to nucleosome-free regions, so called HS sites which play important roles in regulating cellular processes such as transcription and DNA replication. The identification of HS sites using isolated nuclei is time-consuming. Furthermore, given that nuclei are usually prepared biochemically using different buffer systems including detergents such as tritón X-100, the possibility that the physiological chromatin structure is disturbed by rearrangement or loss of DNA-binding proteins during the preparation, cannot be excluded. To avoid this problem, and in spite of the fact that the chromatin is not static, but dynamic by relevant DNA-protein interactions, it is necessary that experiments studying transient chromatin changes are done on intact cells. Therefore, in this work, we used lysolecithin to partially permeabilize the cell before digestion with DNase I. The use of lysolecithin for in vivo footprinting studies has been already reported (Pfeifer and Riggs, 1991). The HS sites detected by the described procedure are very similar to those generated from experiments using isolated nuclei. Furthermore, results obtained from our study demonstrated that the protocol used was not only fast and simple, but also useful for studying dynamic chromatin in vivo. Here, we observed changes in the chromatin at the OBR and GAS 41 promoter during the cell cycle. The DNase I sensitivity of the region was higher in G1 phase than in the other phases. Accordingly, the accessibility of the chromatin to nuclear factors seems to be higher in this phase. Because the OBR co-maps largely with the GAS41 promoter, we cannot exclude the possibility that the observed chromatin changes in G1 phase are related to the transcriptional activity of the GAS41 promoter. If this is the case, one would expect a higher expression of the GAS41 gene in G1 phase than in the other phases. However, using Northern blot procedure for analysis of RNA from synchronized cells, no differences in GAS41 mRNA expression were detected during the cell cycle (data not shown). Therefore, it remains possible that the chromatin changes observed in this study are related to a functional role in DNA replication. Cell cycle-dependent disturbances in chromatin structure at origins of DNA replication have been reported. These chromatin changes are correlated with the respective accessibility to nucleases. For example, the DNAse I sensitivity of the histone H3/H4 autonomously replicating sequence (ARS) element of the yeast Saccharomyces cerevisiae is higher in S phase than in pre-replicative phases of the cell cycle (Brown et al., 1991). On the other hand, in Chinese hamster ovary CHOC 400 cells synchronized with mimosine, an inhibitor of cell cycle progression in late G] phase (Lalande, 1990; Hoffman et al., 1991), the chromatin in the ori-ß and ori-γ of the dihydrofolate reductase locus undergoes dramatic alterations in nuclease hypersensitivity (Pemov et al., 1998). Increasing evidence indicates that chromatin remodeling is essential for increased accessibility of nucleosomal DNA to transcription and DNA replication factors (Narlikar et al., 2002; Bozhenok et al., 2002; reviewed by Becker and Horz, 2002). Indeed, recent studies using synchronized cells suggest that cell cycle changes in chromatin by nucleosome remodeling at origins in the G1 phase are important steps involved in controlling replication initiation and replication timing in eukaryotic cells (Zhou et al.,2005; Li et al., 2005). At present we do not know about the exact molecular mechanism of the cell cycle-dependent chromatin changes observed in this study. Whether the increased chromatin accessibility to nucleases at the OBR and GAS41 promoter in G1 cells is caused by nucleosome remodeling, we will investigate in a further study. We thank Dr. J. Kjaer for critical reading of the manuscript. This work was supported by the "Deutsche Forschungsgemeinschaft" (Ph 52/3-2).